Here’s the two main pieces of hardware I used for the project, an Arduino Pro Mini and an RFM69HW, as well as a couple of pieces of wire for antennas, and a Relay board to trigger the doorbell. I had to use the small boards, as I was fitting everything inside the chime casing on the house side, and inside the gate controller box at the property entrance. Connecting the Pro Mini to my PC was then a simple case of soldering on the FTDI header. 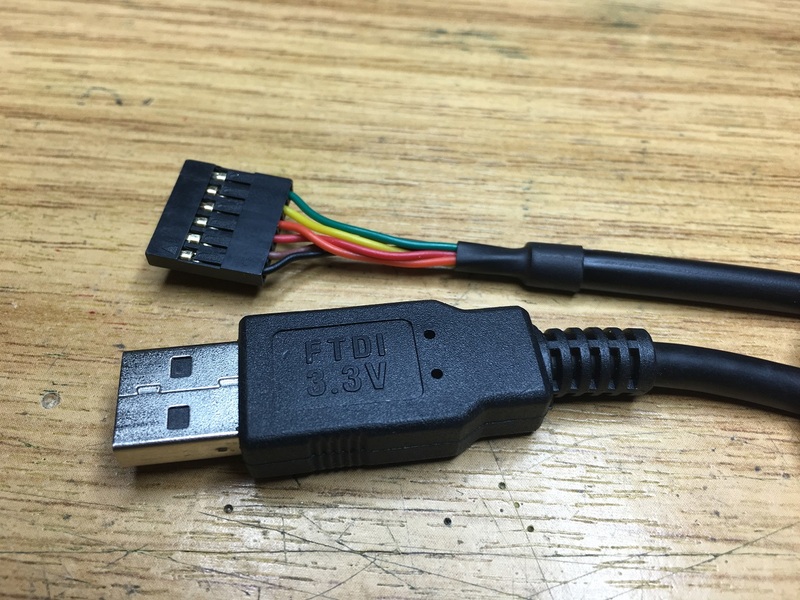 The following picture shows the Pro Mini connected via FTDI cable to the PC, and the RFM69 connected to the SPI bus, as well as the Interrupt pin and power. 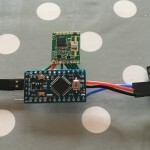 If you’re interested in trying out the RFM69’s yourself, then have a look first at the excellent “Introduction to the RFM69HW Transceiver” at AllAboutCircuits.com . It has some great diagrams for wiring, the same ones I used for the setup here. So, I set up a couple of transceivers, each with a ~16cm piece of wire hanging off the antenna pin. I got good range with a 15.8cm, other sources say 17cm is better for 433MHz, but I didn’t spend much time tuning. Running the same sketch on each Arduino, I was then able to see packets being sent from one transceiver to the other. Once I had that much working, I needed to work out how to switch on the 12V AC needed for the doorbell. 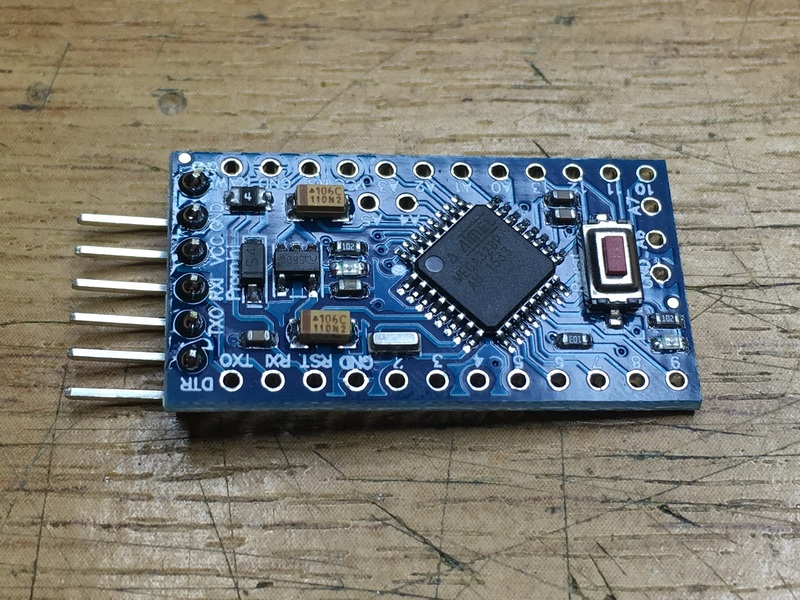 I had some relay boards suitable for Arduino lying around, so I tried out one at 3.3v, and it switched on and off fine. Using this I was able to switch on the 12V AC to the doorbell for a second to allow it to chime. Here’s a pic of the circuit with the relay. 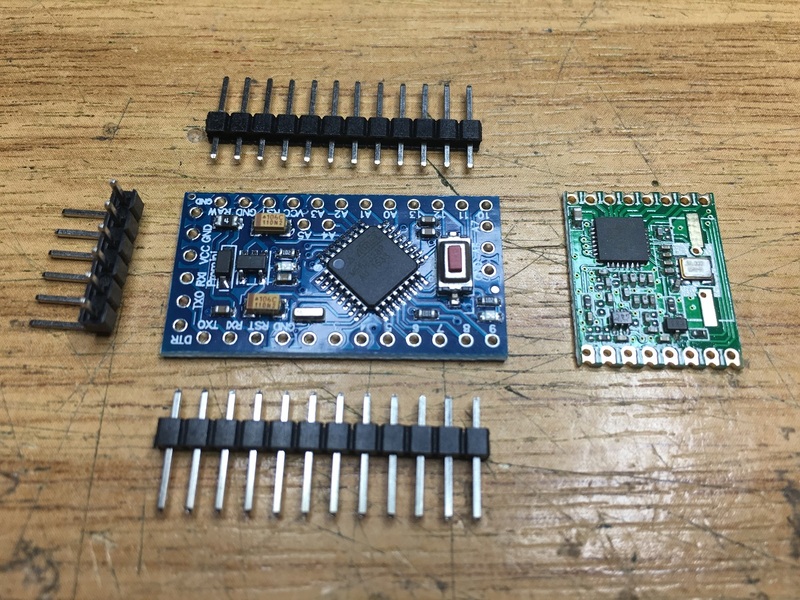 The small board on the left is a 5v to 3.3v converter. 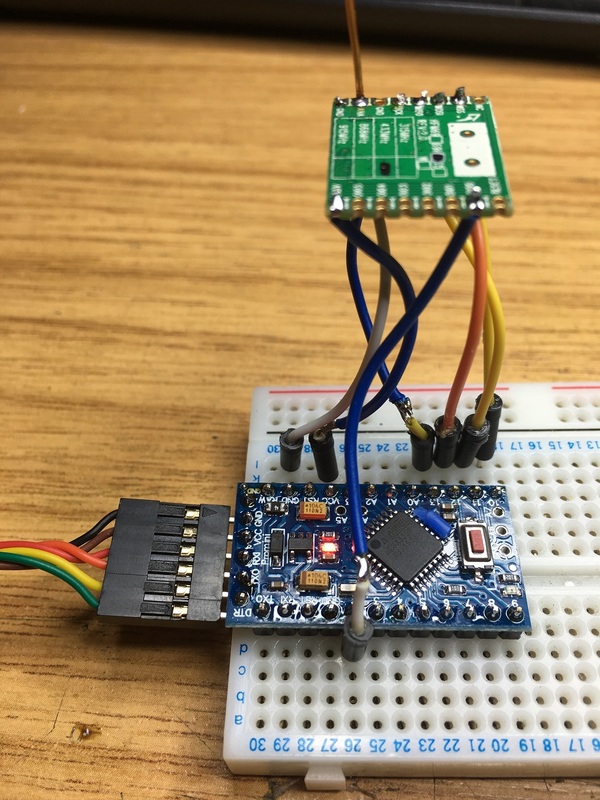 I have 5V available at the gates, but the RFM69 is 3.3v only, and cannot be used at 5V, so everything had to work at 3.3v, Arduino, Relay, etc. Also, you can see the relay is activated by pin 9 of the Pro Mini. This was the only modification I had to make to the sketch – bring pin 9 low for a second when it got a valid message, thereby enabling the relay, and chiming the doorbell. 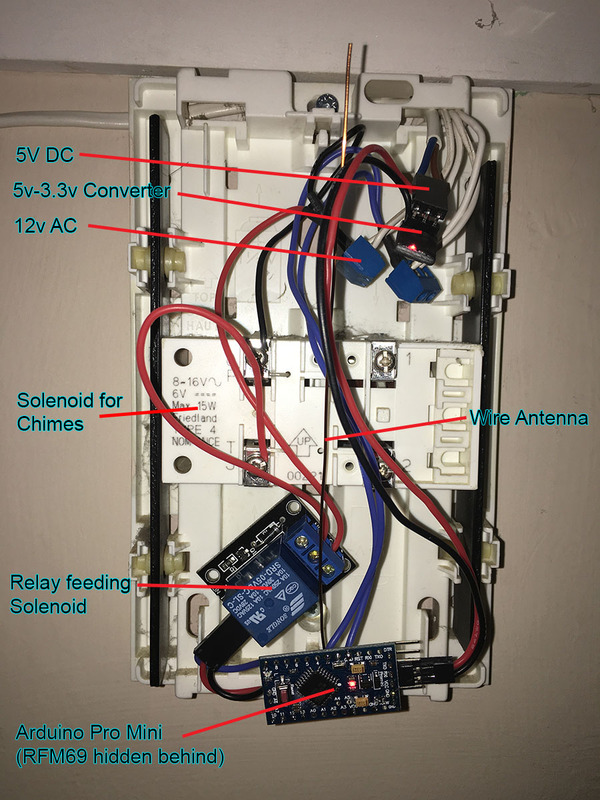 Here’s an image of the contents of the doorbell enclosure. Messy enough, I’ll probably tidy it up later. Everything fits when I put the case on, and the chimes (black metal bars on either side) are clear of any obstruction so chime cleanly when hit by the solenoid (centre of image). The wire antenna also fits nicely inside the enclosure, that’s one of the reasons that the RFM69 is mounted so low down, so that the antenna will fit.